committed to bringing innovation and creativity to the model home industry. At Dulce Design we are dedicated to our clientele, we understand the value of availability and the importance of providing an intimate working relationship with all of our clients. Our exceptional design team continually offers the freshest concepts to captivate and excite today’s home buyers. We pride ourselves on our ability to be versatile while maintaining incomparable quality. The result is a final product that is stylishly refined as well as cost conscious. For a crisp approach to clean, customized designs for your next project, choose Dulce Design, the full service design firm with an unparalleled level of commitment and a truly inspired design team. View our model home project gallery. 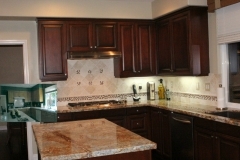 View our kitchen design project gallery. View our bathroom design project gallery. View our bedroom project gallery. View our family living space project gallery. View our dining room project gallery. View our misc project gallery. View our before & after project gallery.